I found this gorgeous palm fragment lying in the gutter during a recent walk. A windy day casualty, it lay partially upon the curb looking like an imploring hand. I stopped to check it out, deciding then that if it were still there upon my return I’d have to take it home. I could barely concentrate on my walk and actually cut it short; I had to get back and see if my palm fragment was still there. It was, so I dragged it out of the street to carry it home. Cradled in my arms, I realized it was pretty big, (about 5-feet in length) and, although light at first, it became too-heavy quickly. In my current condition I’m unable to carry much weight comfortably, so I stashed it behind a wall until Paul and I could pick it up in the car. I worried that it would be picked up by street cleaners, but a few days later when we went to pick it up it was there waiting. It’s now in my studio and everyone who visits is amazed by it. I’m not sure what I’ll do with it — maybe paint it, maybe paint onto it — but I’m inspired by its size, forms and textures. I wondered if other artists dragged nature’s fallen bits home … and found that they do! 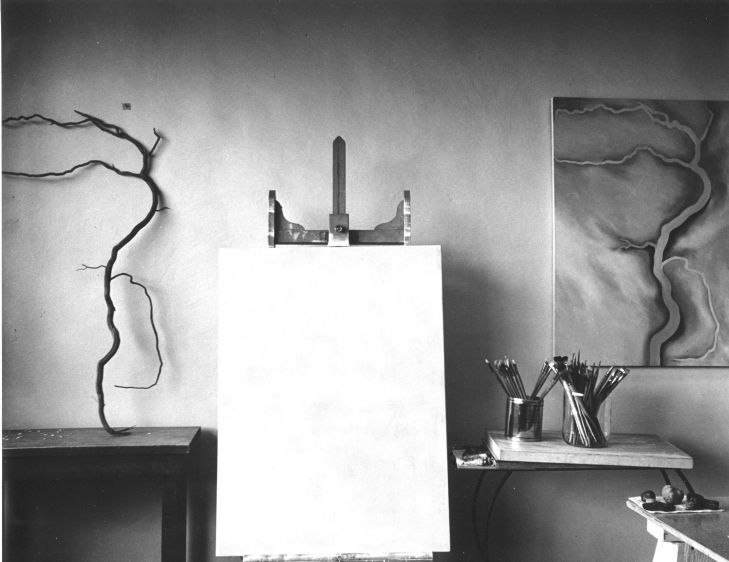 The photograph below is of Georgia O’Keefe’s studio with a branch as model, the obvious subject of an nearby abstract painting. This fragment — the flower stalk from my favorite aloe ferox — had finally become desiccated enough to remove but I found myself unable to toss it. How could I simply discard something that looked like a 3-D scribble, or a collection of tentacles frozen mid-swirl? I brought it into the house and placed it on the hearth where it complements the dark-on-dark color scheme I have going on there. 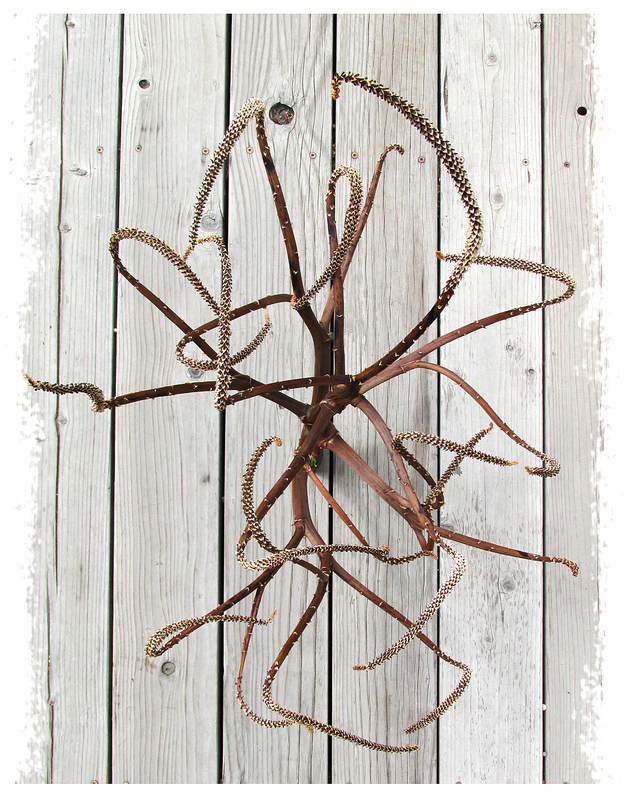 As I pointed out in this post from 2010 (click), dried aloe stalks remind me of the work of painter Brice Marden. 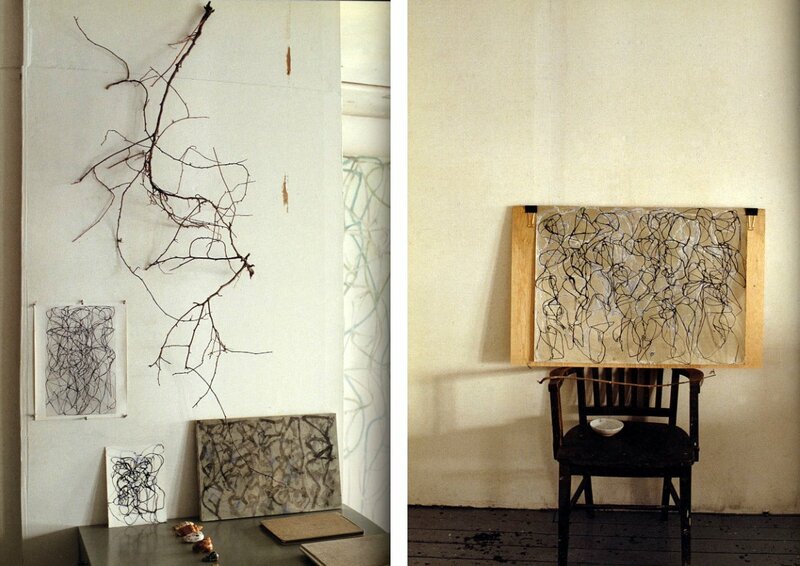 I was excited to find a picture of his studio, too, with a shapely branch being used for inspiration. Georgia O’Keefe and Brice Marden are American artists of the highest order; I don’t mean to imply that I’m in their league in any way. But, knowing their work — and that nature served as its inspiration — is heartening. I hope to use my natural souvenirs similarly. It’s fun when you’re out walking and come across something fantastic. I’ve been known to carry a burnt Manzanita branch miles off a mountain while hiking, just because I liked the way it looked. I like the artist comparisons you gave as well. I’ve never heard of Brice Marden, so I’m going to have to look him up. I’ve seen some of your souvenirs, WF, and I know you have a great eye! I love Marden’s paintings. I don’t always care for abstract works but his are very sensual and interesting. What a wonderful treasure you’ve found. 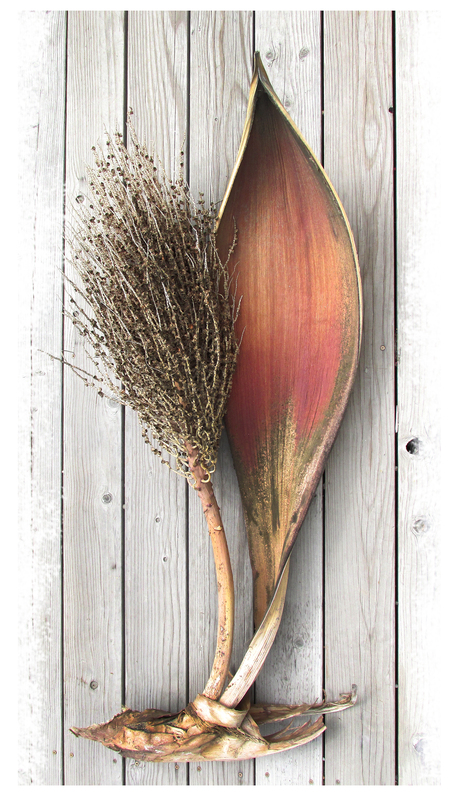 I’ve been pining for days about some wonderful huge seed pods falling from a tree in our hood…(Danny has nick-named it the Q-tip tree)…..saw them while walking, had nothing to put them in, didn’t even pick up one!!!!!! next time I went by the gardener had just finished throwing them away….the next time Danny said no, no no and I listened….now YOU have inspired me to go back today and see if the wind yesterday brought anymore down…..I must have some….cheers my friend. The palm tree “boat” brought back memories of my childhood in Glen Avon, just to the south of you. My best friend’s mother was a natural born artist. She would take these boats and use them as a basis for a floral arrangement, fresh or dried. I like the palm fragment just the way it is. Amazingly, it looks as if the “base” has been arranged by human hands to add to the artistic nature of the piece. I agree, it’s perfect as is, JA! Love that fragment ‘as is’ – nature is so inspiring! No argument here … I’m continually amazed and surprised by nature, too, Jenn! You have a wonderful site – and I love the many transformations of your environs. Shelly, welcome, and thanks for such a great comment. I will definitely explore Ms. Asawa’s work further; just from a quick look, it’s wonderful!